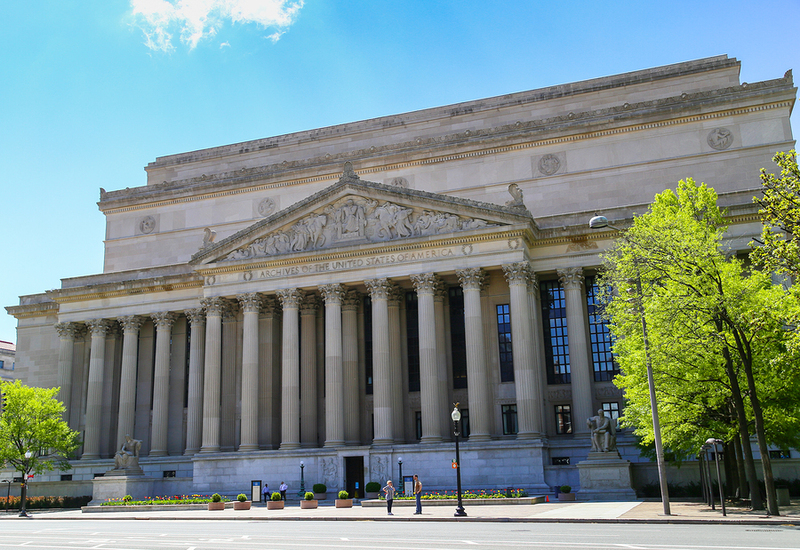 The National Archive building is home to some of the most important documents in American history and is a huge tourist attraction. Far from just housing a few key documents, this building is filled with knowledge and artefacts from days gone by. The rights that we enjoy as American citizens are enshrined within this building, which has protected them for many years. Prior to this looming structure’s completion there was no official place to keep these documents for more than 150 years! They would be kept in governors’ homes or offices, leading to quite a few cases of lost documentation. The plans for such a place were approved by Congress in 1926, which is later than some visitors realise. The loss of important documentation due to theft, fires and careless bookkeeping spurred Congress to collate these documents in one place. John Russell Pope, architect of structures like Union Station and the Jefferson Memorial, was on the architectural committee of this project. The design of the building turned out to be one of its greatest obstacles to overcome as it soon became apparent it was a larger task than originally thought. Because of its size and intricacy, this building would take four years and cost Congress millions of dollars. The Declaration of Independence, the Bill of Rights and the Constitution were moved to the building in 1952 to be showcased to the public. These three documents are the cornerstone for life as an American, as they hold all of the rights and laws of the land. These documents are regularly called upon to defend citizens in the face of injustice and they have always been key to ensuring that each citizen have the same rights. This massive building doesn’t just hold these three documents though, as there are a plethora of other historical documents taking up these archives. Letters and historical documents are stored here as precedent for other legal cases and intercession from the government. One of these documents that made a huge difference in its time is the letter from Harvey Milk to President Carter. This letter was instrumental in defeating a proposition to remove LGBT individuals from the public schooling system. Patents are also held in this building and they have some of the most famous ones on display here. The shape of the iconic Coca Cola bottle has been patented and the original document from 1915 can be viewed. This was the first bottle to look any different to others on the market and can only be used by this company. Fans of civil rights history can also view statements from the Bloody Sunday march at Selma. These documents serve as a reminder of the violence that was endured by protestors for equal rights. They contain witness statements and descriptions of the acts undertaken by Alabama police against the protestors. This investigation was key to bringing in the Voting Rights Act, which guaranteed that black and white citizens would have the same requirements and freedom to vote.